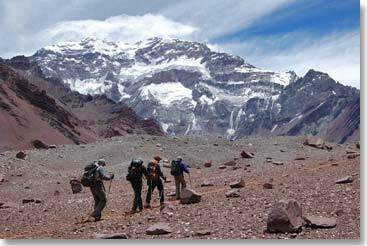 It is about 1pm, Sunday, 30th of December, and I am calling you from about 13,100 ft., 4,000 metres above sea level, in an area called Plaza Francia on the glacier moraine beneath the stupendous, giant south face of Aconcagua. It is a beautiful day, probably the mildest temperature I have seen up here at this elevation. This is a typical side hike, or acclimatization hike that we do from Confluencia camp, at about 11,000 ft.
We got to camp Confluencia yesterday in a surprisingly short time hiking, we were keeping a good pace. We didn’t have to rest or stop much and we got there in the early afternoon. The Bolivian staff, Osvaldo, Maria and Sergio set up the tents, we had a nice lunch, we had pizza for lunch and took it easy in the afternoon yesterday that equals the acclimatization at this altitude of course. Just being here, light activity helps our bodies adapt. We had a great dinner last night at Confluenzia. Our hostess here is Madeline, she runs the place and she cooks the meals at this camp and we had a great Argentinian beef, potatoes and grilled squash for dinner. Now we are just going to enjoy the views up here for a while and return to Confluenzia and Madeline’s little camp down there where we are living, all 6 of us. 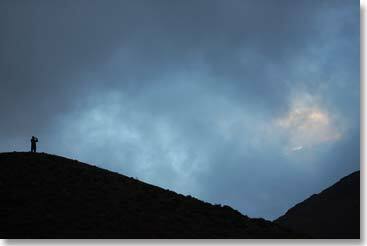 We are going to have another acclimatization night before we ascend to Plaza de Mulas. We are doing great, we will keep you posted. The weather is good, I hope this keeps up with the weather. 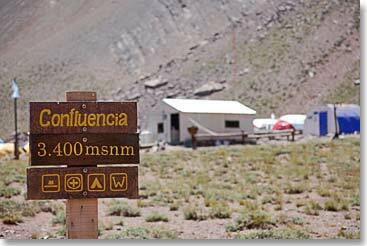 The trek to Plaza Francia, the base of the south face of Mount Aconcagua, is spectacular and a great acclimatization hike. 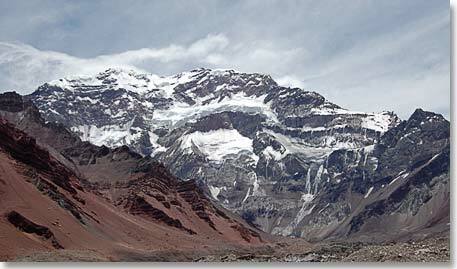 The south face of Aconcagua is one of the toughest climbs in south America, only a handful of climbers attempt that route each year.